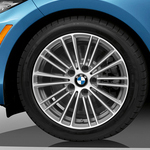 One of the most popular convertibles lineups on the road today is the BMW 2 Series. The iconic BMW brand paired with all of the performance and design additions of a convertible make this car the first pick for thousands of car buyers every single year. That is why our team of convertible experts at BMW of Nashville are so happy to tell you all about the all new model! First, drivers will notice the haunting glow of the LED headlights in this vehicle. Not only do the last longer than traditional headlights, saving you replacement costs over time, but they also shine brighter, helping you see better in poor weather. Finally, the 335 horsepower engine is enough to make any car enthusiast happy. This engine allows drivers to accelerate from zero to sixty in just 4.2 seconds thanks to powerful torque leaving the competition behind.